Life with a toddler is hectic. We all know this and yet we tend to try to add more ideas to our plate all the time. Maybe tomorrow we can all sit down and say the rosary? Or we can not only eat dinner together, but we can take time to each talk about 3 positive parts of our day. These are great ideas, but they often don’t pan out just like we hoped they would. Instead the toddler gets a runny nose and needs to go to bed early so there is no time for a rosary, or dinner gets burnt and everyone is fussy because of it. Whatever the reason, it almost always happens. So, when something comes along that makes fitting faith into parts of your day in an easy, quick, and FLEXIBLE way, we take advantage of it! It’s important for kids to know that no matter what is going on in their hectic day, God is with them and so are you. 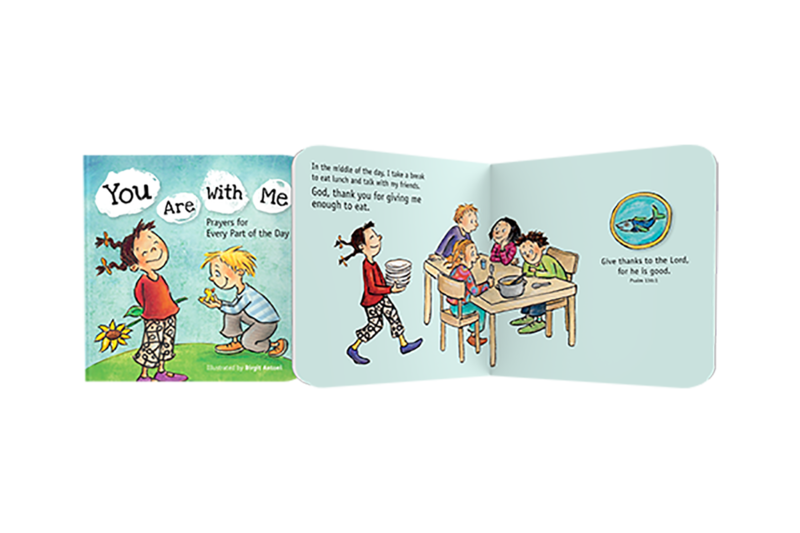 Our newest book, You Are With Me: Prayers for Every Part of the Day is a board book of prayers that helps children learn to talk to God all day long! It’s an easy and quick read for school, daycare, playtime, mealtime, family time, or whenever works best for you. Each page pairs with Psalms for a quick biblical connection.